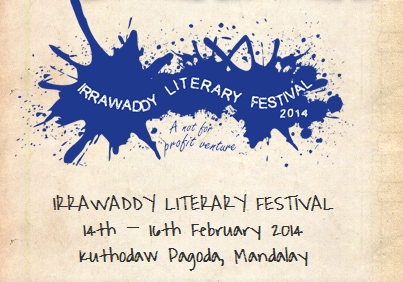 The second Irrawaddy Literary Festival is taking place in Mandalay from 14-16 February 2014 at the Kuthodaw pagoda, Mandalay Hill. The Festival’s patron, Daw Aung San Suu Kyi, has confirmed to organisers that her attendance and personal participation will be on Saturday 15th February. She will spend several hours at the Festival, taking part in two of the Festival programme’s hour-long sessions. As the Festival is a not for profit venture all sponsorship funds are directly used to produce the event. For the Mandalay Festival, generous sponsorship will enable state of the art LED screens to project the Festival’s highlights, live, to the public areas of the pagoda compound. Plans also include simultaneous interpretation of all of the headline events, as well as the vast majority of other sessions so that, whether Burmese or English speaking, audiences can enjoy the Festival to the full. Individual readings, panel discussions, workshops, documentaries and movies will be complemented by several important exhibitions from abroad. An exhibition of early Burmese photography, depicting everyday life as well as officialdom of the day, is being brought to the Festival by a team from the British Library. The exhibition will remain permanently in Burma after the Festival. It is a central principle of the Festival that any Burmese writer who wants to participate is welcome to do so. There is still time to let the organisers know that you would like to take part. Please contact Dr Thant Thaw Kaung at Myanmar Book Centre, or Nyi Sae Min at ludupress@gmail.com. Entry to the Irrawaddy Literary Festival, Mandalay, is free, throughout the three day event. The ILF Mandalay promises to be even better than the inaugural Festival in 2013.